The creative way of the group started in 2001, when Dan Auerbach and Patrick Carney decided to work together. The musicians were performing in small clubs around their native town, and when the duo got enough material, they decided to record the debut album. Well, The Black Keys began the recording process, which took place in the basement at Patrick Carney’s place. The musicians were using an old cassette recorded, and even in spite of the absence of professional equipment, they managed to create an amazing long play: The Big Come Up played a very important role in the band’s development and formation. Then there were more shows, and of course the new material appeared. It was recorded with the help of the same cassette recorder, in the same basement. One of the brightest blues-rock bands of modern times started its career just like this, in such severe and almost Spartan conditions. Combination of the extremely energetic rock and blues notes was enjoyed by listeners all around the globe, and the duo was walking towards the world fame, step by step. The band nowadays is really famous and called for, however it did not change anything it the creative process. The musicians remained faithful to themselves, which means that they continue playing the sincere music, experimenting with various shades of rock directions. Well, they proved to be really good at making such musical cocktails. Moreover, the duo is always in the movement – Dan and Patrick release the new long plays almost every year. 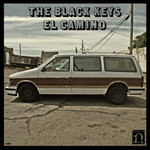 Thus, the musicians pleased their fans with the new studio attempt El Camino in 2011. That record became their seventh piece in the discography. The rockers won Grammy Award in the category Best Alternative Music Album for their previous album Brothers. After such a success everybody were expecting at least not less interesting work from the duo. Actually, The Black Keys never gave a reason to question their strength and intuition. Well, the release of El Camino finally took place and we can get acquainted with it properly. The long play’s very first composition, Lonely Boy, immediately catches a listener’s attention with a truly rememberable guitar part – the musicians are well known for their possibility to get attention without using hundreds of instruments in their songs. Lonely Boy is followed by the track called Dead And Gone, which proudly presents original vocals. Gold On The Ceiling is another outstanding composition, which will make you want to clap or beat time. And it will be great to have dusty boards of some time-tested and battered rock club under your heels. There is no doubt that The Black Keys are awesome at creating the atmosphere. It is worth mention that they are also great at playing around with styles and musical directions. Thus, their sound sometimes reminds of ZZ Top, then it may slightly change towards The White Stripes. But we are not talking about any kind of imitation - The Black Keys is absolutely distinctive and unique band. It feels that El Camino is nothing but a quintessence of sound and pure action. Its compositions can be just taken to soundtracks of action movies or adventure blockbusters. And all this had been created only by two musicians. Nevertheless, the rockers also enjoy the lyrical songs as well, and the mid-tempo composition Little Black Submarines can be an excellent example of that (still, by the end of that track it is getting a really incredible tempo). The most significant and most amazing thing that The Black Keys keep on creating their music in the way they used to do it ten years ago: sincerely. They do not adapt to the fashion, because they have a good reason not to do that – they found their style, which exists separately from trends. A bit dirty sound and some kind of carelessness have always been the elements of The Black Keys’ compositions, and it seems that the situation has not changed. In that case this is just great, because a good sound does not imply clean studio sound. It implies vivacity and emotions. The duo has no problems with that at all.